**note**A TON of the info and pictures on this thread came from ILK's thread(link at the bottom of this page). This is a repost at his request. If I'm missing info or have a mistake, please let me know. DISCLAIMER: this information is not maintained by ATA and may not be up to date. Last edited by Resilience on May 26 2014, 10:40am, edited 52 times in total. If you're on idevice, just scroll down. Last edited by Resilience on Apr 1 2014, 8:48pm, edited 23 times in total. 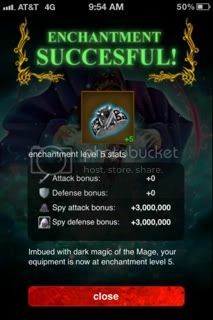 First off, you will need to unlock The Mage to upgrade equipment(explained below). 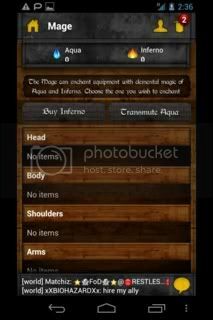 Secondly, you need to obtain items that the Mage can use to enchant(explained below). Thirdly, you have to earn equipment can be enchanted(explained below). Last edited by Resilience on Apr 1 2014, 8:49pm, edited 13 times in total. Last edited by Resilience on Apr 1 2014, 8:49pm, edited 33 times in total. To gain access to The Mage you need to upgrade your castle to level 3. You will need to open at least 12 highlands to unlock the ability to upgrade, and it will cost 10 bil to go from lv2 -> lv3. 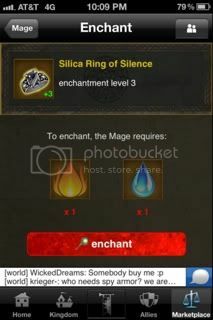 ENCHANTING IS PERMANENT it can only be undone if you reset and lose all equipment or it resets during an attempt to enchant. Last edited by Resilience on Apr 1 2014, 8:49pm, edited 9 times in total. If you're on idevice, links will take you to the page, just scroll down. Last edited by Resilience on Aug 15 2014, 1:39pm, edited 134 times in total. *There is a chance of the enchantment failing. This is the risk of enchanting. 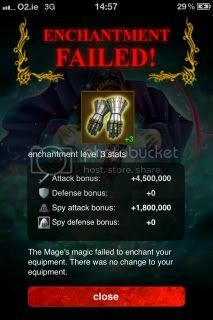 When you fail, there is a chance that your equipment will drop to base stats, stay the same level, or drop any number of levels. Last edited by Resilience on Apr 1 2014, 8:50pm, edited 9 times in total. Also, a shout out to madness, SpiritShadow, Blerghy, Weaslo, MerlinsBeard, Sheep_Hate_Me, Hggggggggg, blackphx, iJacob5, Il_WaR_II-R-I-S-E-II_LoR_lI, ShamefullySwordless, III____Lord_Doom____III, Steph, blackphx, gavigan, and -Rise_Against- for giving me info and pics, thanks a lot guys, you were a big part in the making of this If I have anything wrong, please, don't hesitate to point it out. Well, that's all folks. Hope this was helpful! First off, biggest shout out goes to ILK who made up most of this guide himself. Also, Sholron, Tiashueothin, Fire-_-Of-_-The-_-Cyndaquil, Divinity__llllIIllIIIIllIlIll, XscapeLSA, Reeb99, C3PO_RIMJOB, gh0st, lIllDllAllRllKlINlIEllSlISIIll, xxJaydogxx, DN_Kassio, W32_SQLE_WormIIIllllIIllllIIII, W32_SQLE_WormIIIIIIIIIIIIIIIIl, W32_SQLE_WormIIIIIIIIIIIIIIIIl, lllllIIIl___TROLL___llllIIIIl, III____Lord_Doom____III, bladepup, Condell, -Nightfall-, Thorin, AuIom, liililiilil_SMITH_liliililiil, Definitely-Jesus, IIHllAIINllDlI-of-llGlIOIlDII, IIHIIAIINIIDII-of-IIGIIOIIDIl, and llHlIAIlNlIDII-of-llGllOIIDIl, xXIXx-GIE__Patriot__GIE-xXIXx. Extra thanks to ___DEFENDER___, the info on the Halloween bow wouldn't have been finished without him. Last edited by Resilience on Apr 1 2014, 8:51pm, edited 35 times in total. Last edited by Resilience on Apr 1 2014, 8:51pm, edited 12 times in total. *This was made out of ILK's request when he retired from kaw. ILK's info/guide. Last edited by Resilience on Apr 1 2014, 8:51pm, edited 20 times in total.